Random ramblings of my 448-day journey around the world. The winds swept across the grassy ground, fluttering the lines of faded prayer flags strewn across the mountain face. Dull grey clouds hovered in the sky as we sat down and prepared to wait one and a half hours for the ritual to begin. I was lucky. I had missed the shared tourist minivan but a driver sharing the room with me in the guesthouse was also scheduled to visit the sky burial ritual with his two clients. Two kindly ladies who are lay-followers to Tibetan Buddhism, they had no problems for me to tag along without any additional payment. And being lay-followers, they easily struck up a friendly discussion with the lama "guarding" the burial site. The Serthar sky burial site is apparently a well-known site, with rituals held every day. As one of the local Chinese visitors in Serthar dryly commented, there is death everyday. A Tibetan practise, the "burial" involves the corpse being offered to the elements after a certain ritual. The stone pedestal in this site in which the ritual is performed on was imported from India some 20+ years ago. Bodies come from all around the region, including Qinghai, Gansu and as far as Tibet! The lama recounted that during the Yushu earthquake a few years back, this site performed the highest number of burials in a single day - 120!! And just the day before, he further commented, there were 11 corpses! How many will today being? "Look behind you" in his Tibetan-accented mandarin. At 1.30pm, the lama beckoned to the two lay-followers and we moved to the actual grounds. From their bags, the two ladies fished out a small little container. They certainly had been informed or have read up on sky burial rituals. The lama nodded and indicated that the cut fingernails and hair should be placed on the ritual pedestal. 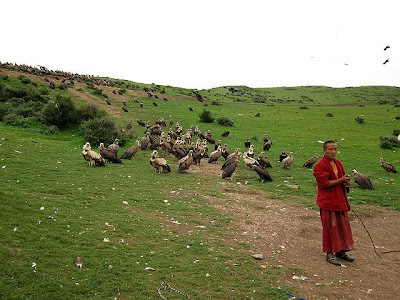 Apparently, by placing your fingernails and hair there, and with the lamas performing the rituals, you could somehow achieve the karma of a "sky burial" when you are finally laid to rest wherever you are. One of the ladies suggested that since we are fated to visit this together, I should also do the same. She promptly produced a nail-cutter where I snipped off a few small pieces, as well as a tiny tuft of my hair using my swiss-army knife. And as instructed by the lama, we then circumambulate the stupa in front of the burial ground - the number of rounds as dictated by one's age. And so as I trudged round the stupa in what seemed like eternity, a cold dreary drizzle began, as if in preparation of the mood ahead. A motorbike sputtered into view bearing the first corpse. In response, the vultures congregated close to the ritual grounds. 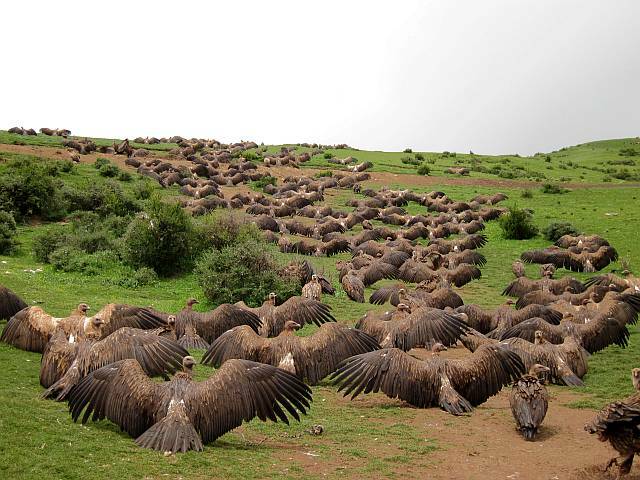 It was an unsettling sight, the hoard of vultures bearing in so close. So much so that a few monks had been deployed to keep them at bay. The air felt fetid, the atmosphere somber and even with the drizzle and the shuffling of the watching people, time seemed to suddenly freeze. I had decided not to describe the process. Photos were also not allowed, although the two lay-followers had come to good terms with the lama apparently, and he whispered to the driver and me that we could take some pictures discreetly if we wanted. Both of us just watched. Somewhere in the middle of the ritual (which were performed by a different person), the sun appeared and bathed the site with light. Our lama chuckled again, and pointed to the side. The waiting vultures, wet from the drizzle, were sunning themselves quite spectacularly! It was quite a sight. I left the ritual grounds to take photos of the vultures. Watching the ritual performed on one corpse is probably enough. There were three adult and (gut-wrenchingly) one infant corpse. These lamas (or Buddhism) view them as just a shell, devoid of spirit or consciousness, and so treat them as such. But the very human trait in us would not and could not face these sky burials as calmly as them. I have seen death or dead bodies before. But here, it was a different experience. Inevitably, a grimace will fill your face, and your heart. And with a shout, the ritual was complete, and the floodgates were opened. The vultures hopped, flew and swarmed over the remains in a feeding frenzy. "And so, irregardless of your status in life, in death, you will be returned to earth/nature," intoned the lama. The two lay-followers agreed heartily, visibly moved as well. Hey, nearly back to home, ha? I am surprise you managed to get there cos I read that the Chinese govt closed Tibet & the surrounding Tibetan areas to foreigners. well not exactly... specially fly to china, suppose to join friends to Ali Tibet, but yeah, govt close Tibet. So I wander around China abit before going to Georgia, Turkey etc. Turkey- you must spend some time in Cappadocia. of course Istanbul. These 2 are the highlights to me. 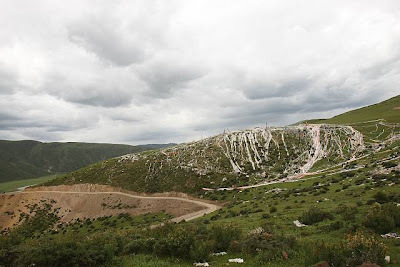 If you can, go to Mt Nemrut- not very big deal but since you are near the Black Sea area (close to Georgia) it is worth a visit. Envy you, my friend. All content and photos in this website are © Wu Swee Ong.. Awesome Inc. theme. Powered by Blogger.